Enrollment for the 2018-2019 year is now closed. We are not accepting new students at this time. 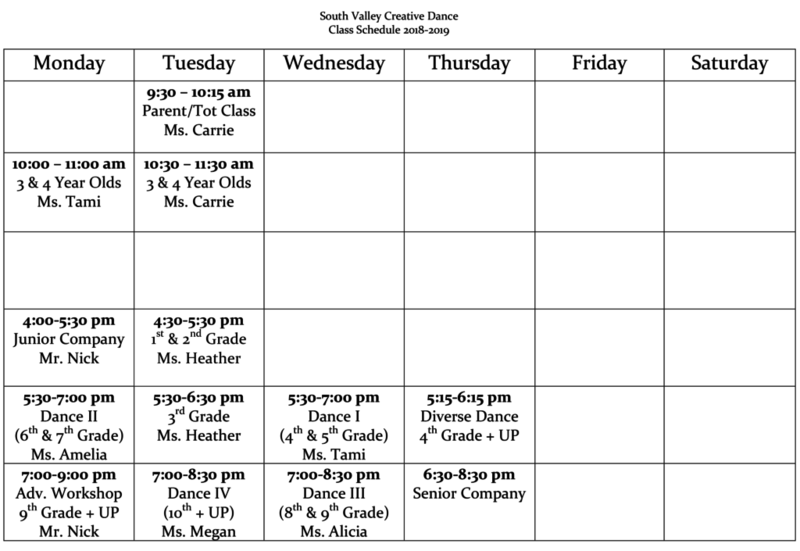 Please check back soon for our summer dance schedule. Enrollment for the 2019-2020 year will open to the public on June 1, 2019. To get an idea of our class offerings, please scroll down to view our 2018-2019 class options. Every effort is made to keep the same schedule from year to year. While we may have faculty changes, we don’t anticipate many changes to the schedule next year. Pleae remember that all classes and times are subject to change and enrollment. Classes must have 6 enrolled students to stay on our schedule past September. Our studio offers referral discounts and family discounts so the best way to ensure your class stays on the schedule is to spread the word! We will not turn any student away! If you find the class of your choosing is full, please contact the studio and we will find a place for you! We want you to be a part of our studio family! Some of our classes have special requirements, fees, schedules, etc. Please scroll to the bottom of the page for more information on our Jr. & Sr. company classes as well as Adv. Workshop enrollment options. Junior Company – is for any dancers in 4th, 5th, and 6th Grade who want to dance an extra night at the studio. This class is a process class focusing on developing skills for choreography, improv, and some technical skills. If you have never taken a company class, this is the class you should enroll in. Be aware, added fees for costumes, fundraising, and performances are required. A parent meeting will be head at the start of the year OR sooner to get all the information to you. This class is optional; however, all students enrolled in this class MUST also enroll in a movement class during the week: Wednesdays 5:30-7:00 for 4th & 5th graders, Monday 5:30-7:00 for 6th graders. Please contact the studio with questions regarding enrollment. Senior Company & DIVERSE DANCE – is for any dancers in 7th grade & 8th grade and up who want to dance an extra night at the studio. This class is a process class focusing on developing skills for choreography, improv, and some technical skills. The age for company has changed this year and we are no longer accepting new 6th grade dancers. Special consideration will be given to exceptional 6th graders who show advanced skills and an invitation MAY be offered to skip Junior company. Please contact the studio for placement. NEW FOR 2018-2019 Year!!! All Creativity-In-Action dancers will be required to enroll in the DIVERSE DANCE class on Thursdays from 5:15-6:15. This class will explore various movement techniques as a way to increase body awareness, skill, and attention to details. Hip Hop, Ballet, African, Yoga, Conditioning will all be explored in month long experiences as a way to warm-up and train company dancers before the usual rehearsal time. Be aware, added fees for costumes, fundraising, and performances are required. A parent meeting will be head at the start of the year OR sooner to get all the information to you. This class is optional; however, all students enrolled in this class MUST also enroll in Dance II, III, or IV during the week. Please contact the studio with questions regarding enrollment. Advanced Workshop – NEW FOR THE 2018-2019 YEAR!!!! This call is open to all Company dancers who wish to take their movement, technique, creative expression, and choreography to the next level. This class is a 3rd night at the studio for those who wish to push and challenge themselves. It will focus on technique, choreographic elements, improvisation, and creative thinking and problem solving. Placement in this class requires an audition and approval of Ms. Julie and Mr. Nick. Dancers in this class will also be required to take a dance II, III, or IV movement technique class during the week as well as the DIVERSE DANCE class on Thursdays and the regular Thursday Senior Company rehearsal time. There is no fee for this class! It will only meet September – December 2018 and is FREE to those who audition and make the commitment to attend a 3rd class each week.